Technological development and enhancement is booming at a fast rate and I must keep up with it. Don’t get left behind! The Medical City of Iloilo held a forum on the prevention and treatment of coronary artery disease entitled, “A Healthy Heart for the Busy Man,” at Hotel Del Rio, Iloilo City. It also served as an opportunity to market their new service in the hospital, the Cardiovascular Centre. The Medical City Hospital, formerly known Great Saviour International Hospital, with their slogan “Where Patients Are Partners”, is considered as one of the country’s premiere authorities on healthcare. Equipped with state-of-the-art medical innovations and competent healthcare team, the hospital truly pushes itself on becoming the country’s most trusted healthcare facility for everyone, regardless of social status. More complex medical services, usually available only in developed countries like the US and Germany, are being made available and reachable for the Filipino people. 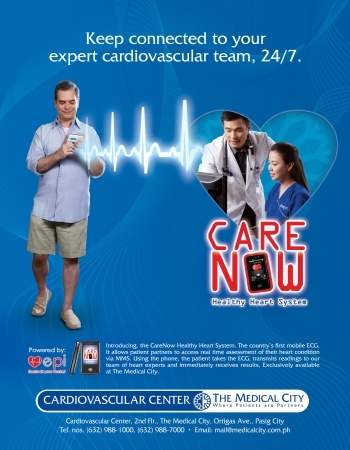 Interesting news during the forum was the announcement of the “CareNow Healthy Heart System.” It is a system which involves the utilization of a CareNow ECG mobile device. Yes, a device, not an app. It is truly a mobile phone where you can call and text using any telecom network but with an added ingenuity. The device, which came from Singapore, allows the user to record his heart rhythm and transmit this recording to the TMC’s 24-hour concierge, who can determine if medical assistance is needed. Every time a patient uses the ECG reading feature, the result is transferred to a CareNow Virtual Health Folder that can be accessed from anywhere in the world through the internet. Truly a first in the Philippines! When I was 5-y.o., it was the Nintendo console that was dominating the gaming market. With its Super Mario adventures and racing games, every free time was gaming time with friends. But when the PlayStation emerged in the gaming market, packed with awesome RTS, fighting and RPG games, it became a gaming sensation. Also, with its idea of a memory card to save key points in a certain game made solitary gaming more worth while and ditching classes for the sake of racing to end a game sooner than your friend a need. Nobody should think low of the games in the first PlayStation because this is the console that started most awesome games that you can see in the PS2 and PS3, even in the PSP. Games like Final Fantasy, Marvel vs. Capcom, Digimon, Resident Evil, etc., all originated from the PS1. Ideas of online gaming for the PlayStation emerged when PC online games became a big hit and was ultimately the competition of most gaming consoles. That is why, Sony came up with ideas to fight the battle with its online multiplayer capability that is most evident in the PS3 console. But they wanted to expand more the reach of online gaming without the need for a bulky PC. The soon to be released, fourth generation of PlayStation focuses more on live-streaming and peer-to-peer gaming. A player will no longer have to play side-by-side with a friend to finish a quest, they both can connect to a single quest but on separate consoles. So they don’t have to do that 2-player screen distribution while doing quests which was very evident in the PS1 and PS2. Take note, because it is going to be a massive online gaming experience, you must consider having a decent internet connection at home or within the area. If not present, then you will not be able to maximize your gaming experience and the consoles capabilities. Most games will be loaded in the internet and also be played using portable devices like the PS Vita.